Rwanda on Sunday commemorated the 25th anniversary of a genocide that tore the small country apart and left close to a million people dead. Tributes were held, ushering in a week of remembrance and 100 days of mourning, corresponding to the time it took for 800,000 Tutsis to be massacred. Every April since 1994, Rwandans have paused to mourn their dead, and on Sunday they gathered yet again at the main sites of the three-month massacre that killed close to one million, to pay their respects. 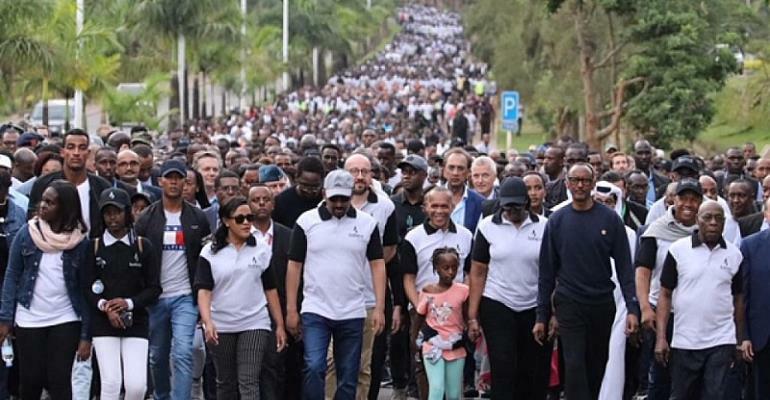 Commemorations began early at the Gisozi memorial site in the capital Kigali, where President Paul Kagame and first lady Jeanette laid wreaths at the burial site, which holds the remains of more than a quarter of a million people. Kagame, joined by EU Commission chief Jean-Claude Juncker and African Union Chairperson Moussa Faki Mahamat, then lit a flame of hope, which will burn for 100 days, the time it took for 800,000 Tutsis to be massacred. “In 1994, there was no hope, only darkness," Kagame said later at the Kigali Convention Centre, a dome-shaped auditorium in the centre of the capital, a modern building emblematic of Rwanda's regeneration. "Today, light radiates from this place. How did it happen? Rwanda became a family once again," he told an audience that included the leaders of Chad, Congo Brazzaville, Djibouti, Niger, Belgium, Canada and Ethiopia. "The fighting spirit is alive in us. What happened here will never happen again," he said. The mass killing of Rwanda's Tutsi minority was ignited on 6 April 1994, when a plane carrying President Juvénal Habyarimana was shot down, killing the leader who, like the majority of Rwandans, was an ethnic Hutu. Hutu extremists blamed the Tutsi minority for the attack and began slaughtering vast numbers of them with the support of the army, police and militias. Men, women and children, many of whom had been their neighbours before the conflict began, were not spared. Kagame has won praise for ending that violence and making advances in economic development and health care. He has also made ethnic reconciliation a cornerstone of his rule. On Sunday, he warned Rwanda's enemies against undermining the country's unity and recovery. Commemorations continued with a march from parliament to the National Amahoro stadium, where thousands, mostly the youth, gathered to say “Never Again.” Twenty-year-old David Shema, was among the crowds. “Today, we are walking just to remember our people who died in 1994, and we are here to commemorate that day, to remember what they did, to give them the dignity so that they can have that value, to make them have that value that they lost,” he told RFI. Inside the Amahoro stadium, which was used by the UN during the genocide to protect thousands of Tutsis fleeing Hutu extremists, texts and poems were read out loud under soft music. Then, the lights were put out, leaving only the flicker of candles to represent the souls of those killed. But for some, the ceremony triggered painful flashbacks, with crying, shaking, screaming and fainting erupting from within the audience. Remembrance is part of the government's strategy to heal the country, but for Sarah Mutoni, the trauma is still raw. “Those people are crying, because they may have seen their mother or father killed when they were looking. That's why they are very sad," the 19-year-old told RFI. Born after the genocide, Mutoni reckons that as "a young generation, it is good to remember those days," but for old people who lived during that time, commemoration is painful and may be better confined to history books. A quarter of a century after the genocide, this east African nation has recovered economically, and is held up as a model for its neighbours. But the trauma of its past still casts a dark shadow. A past which the government and many Rwandans are determined not to forget, to ensure that its horrors are never repeated again.